I extract this recipe from my good old book "Que Cocinare hoy?" de Nicolini, with only 1 change, instead of only 6 Tbsp of Cocoa, I used 12. Use it in your next chocolate cake adventure, this fudge is great on old fashion cakes, and specially in German Chocolate Cake, Rolled Cake; also if you keep it a bit runnier you can drizzle over ice-cream. “For my kids, the recipe is in the Nicolini Book, the book that your mama and many other mamas had learned to cook and bake with. There is no Culinary School that overpasses the classics and this cake is one of those. 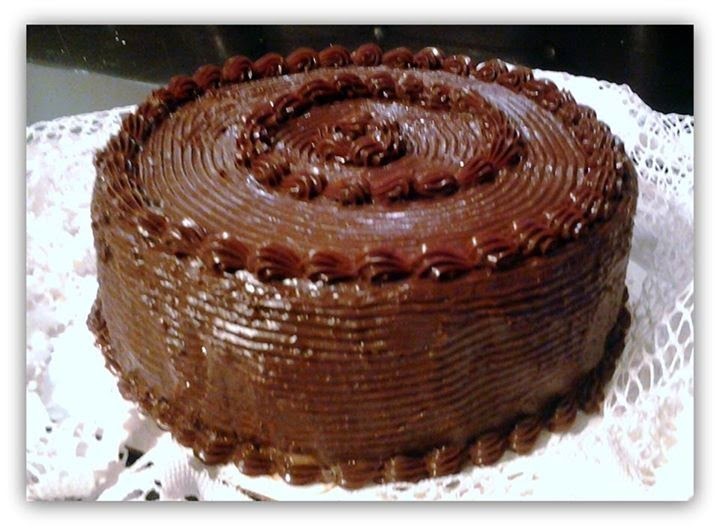 In all the birthdays, those where your house is full with neighbors and cousins, they need it to be a Chocolate Cake. I will make you later the one that my mom used to make for me, because even so I loved this Chocolate Cake, it was not the one I asked for." ON A HEAVY POT, ADD 1/2 CUP WATER AND HEAT THOROUGHLY. ADD 12 TBSP COCOA POWDER (HERSHEY BRAND); MIX WELL, NO LUMPS. ADD 2 CANS EVAPORATED MILK AND 2 CANS SWEET CONDENSED MILK. USING A WOODEN SPATULA STIR CONSTANTLY (I MEAN IT) UNTIL YOU CAN SEE THE BOTTOM OF THE POT. TAKE IT OFF THE FIRE AND ADD 1 TBSP OF BUTTER , STIR WELL AND LET IT COOL. TO SPREAD EASILY MAKE SURE IS A LITTLE WARM.